Blue Cross Blue Shield, AETNA, CIGNA, HUMANA and United Healthcare. 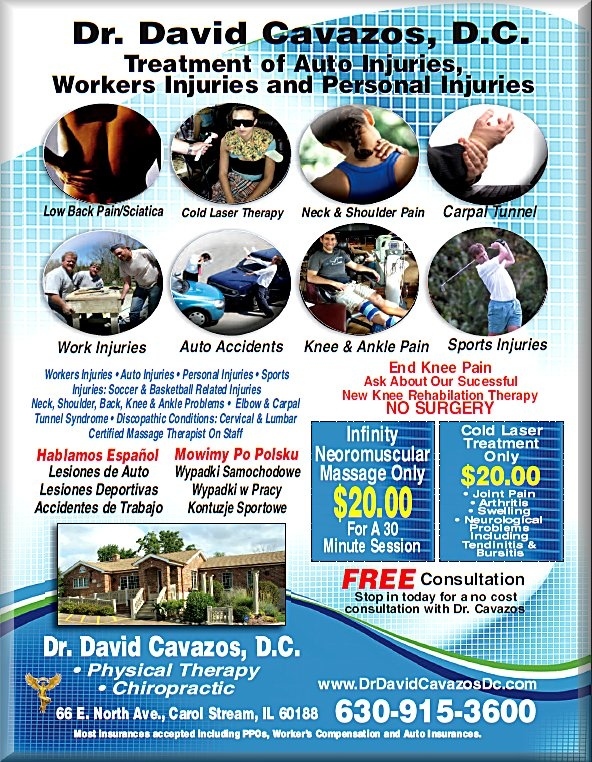 Thank you for visiting the site of Dr. David Cavazos, D.C.,LLC. AT THE BOTTOM OF EVERY PAGE THERE IS AN OPTION TO TRANSLATE THE ENTIRE PAGE TO DIFFERENT LANGUAGES. Dr. Cavazos invites you to browse this site. You are welcome to stop by his office in Carol Stream and see why so many patients choose Dr. Cavazos as their chiropractor. . .
Dr. Cavazos offers state of the art digital xray machine with imidiate processor, acupuncture treatment for conditions, including neuralgias, sciatica, TMJ, trigeminal neuralgia, headaches, sinusitis, vertigo, ringing of the ears, palsies, neck and low back pain, shoulder conditions, knee conditions. Dr. Cavazos also works with various physicians, neurologists, podiatrists, and osteopathic physicians from the Amita Health network to help his and their patients get the necessary treatments to relieve the issues that ail them. Patients seeking treatment with Dr. Cavazos receive only the finest quality care through the use of modern chiropractic equipment, technology and physical therapy. Dr. Cavazos and staff have a genuine concern for your well-being!